What Does Preserving the Second Amendment Require? Per SCOPE’s Articles of incorporation, we are dedicated to preserving the Constitution and in particular the Second Amendment. Let’s explore what that means. When any law is proposed, the first question should be: is it constitutional? (The second question is: if it is constitutional, is it good law?) What is the basis on which it should be decided if it is constitutional? The late Justice Antonin Scalia was an outspoken believer that the words in the Constitution mean what they say and not what judges wish they said. The words have to be interpreted to mean what they meant when the constitution was signed or the amendment was enacted. This is known as “Textualism”. Unfortunately, the Progressive Left believes that only when their interpretations fail should the court reluctantly refer to the actual written words. Of overriding importance, words need to be taken “In Context”. A sentence may mean one thing when standing alone but quite another when taken in context of the body within which it was written. When interpreting any part of the Constitution, that part does not stand alone and must be interpreted within the intention of the entire document; and that overriding intention was to limit the powers of the Federal Government.“The right of the people to keep and bear arms shall not be infringed” must be interpreted in the context of the limited powers of the federal government to infringe on it. Does that mean that non-federal government bodies, such as the states, can infringe on our rights? The 14th Amendment says, “No state shall make or enforce any law which shall abridge the privileges or immunities of citizens of the United States”. What part of “No state shall…” does the liberal left not understand? Further enforcing the founders idea of a limited government, several states insisted on a “Bill of Rights” before they would approve the Constitution. (New York was one of those that insisted, which demonstrates how far the SAFE Act has taken NYS from its roots. )The primary authors of the Federalist Papers, James Madison and Alexander Hamilton, believed the Bill of Rights was not necessary since the limited powers of the government would not enable it to take away rights. Happily, those favoring a written Bill of Rights prevailed. Can you imagine today’s gun debate if there were no Second Amendment? The Constitution was written to stand the test of time. It dealt as much with human/political behavior as it did with the functioning of government. The framers set political ambition and jealousies in opposition to each other by creating three coequal branches of government. The principles embedded in the Bill of Rights transcend time; they are applicable as long as political human nature exists. The Second Amendment is as central to the Constitution as is the Senate, the Presidency, the Judiciary or the Commerce Clause. Those attacking the Second Amendment are not attacking some adjunct piece of the Constitution, they are attacking the Constitution itself, just as much as if they were conspiring to bypass or eliminate the powers of the Senate. Presidents, Congress, the Supreme Court all take an oath to defend and support the Constitution of the United States against all enemies and that they will bear true faith and allegiance to the same. Defend means: secure, shield, uphold, guard, preserve, protect. Support means: care for, back, uphold, boost, defend. Per their oaths of office, they are obligated to do the same. This applies to the entire document, not just those parts that they like. Anything less violates their oath of office. Supreme Court Justice and uber-liberal Sonia Sotomayor wrote in a dissent concerning one of Barack Obama’s overreaches, “The people should not have to wait for Congress to act”. The majority of the Supreme Court felt that the people SHOULD WAIT for Congress to act since that is the way the Constitution requires legal actions to be taken. It also raises the question of how did Sotomayor become the people’s unelected representative? If there is a group that believes the Constitution is outdated and changes are needed, the legal way is by amending the Constitution. It’s been done twenty seven times. Only one of those Amendments took rights away from the people (Eighteen – Prohibition) and that one was the only Amendment ever reversed. “We the people” are in charge, not unelected judges and we need to take back that power. As Alexander Hamilton said, “Liberty can have nothing to fear from judges who uphold the law. But liberty has everything to fear if judges try to legislate, too.” Justices must not be allowed to usurp the people’s constitutional powers by rewriting laws to align with their personal views. The Constitution is a living document in the sense that its principles live on and are applicable to all generations. Are you tired of politicians lording over us as our masters and telling us what to do? We can strike back by voting. Angry about Upstate New York’s values, rights and economy being trampled down by New York City politicians? Upstate gun owners, themselves, have the ability to turn that around; all they have to do is vote! When people say they do not have a voice, that’s only because they are not speaking by not voting. Want to say “up yours” to the politicians? Vote! SCOPE estimates there are 5.5 million gun owners in New York State. The lowest estimates for NYS are 4 million gun owners. There are 19 million people in NY State, so between 1 out of 4 and 1 out of 5 New Yorkers is a gun owner. As New York City makes it very difficult to own a gun, the vast majority of these gun owners are in Upstate New York. In 2017, there were a total of 2.017 million union workers in New York State verses 5.5 million gun owners. If we could get just one-half of all gun owners to vote, we would be the biggest political force in NY State. In 2014, there were less than 4 million total votes cast in the governor’s race. Cuomo got 2.1 million votes and his challenger (Astorino) got 1.6 million votes. Since not everyone who voted for Astorino was a gun owner and some gun owners probably voted for Cuomo, it’s reasonable to suggest that only about 1.2 million gun owners voted, or about 1 out of 4 gun owners. If you want a politician’s attention, one needs to supply money or votes. It costs nothing to vote. Politicians are well aware that gun owners will not vote; one party feels free to attack us and our rights and the other party has shown no overwhelming need to defend us, since neither pays a price in elections. Some gun owners will say they don’t vote because they don’t like either candidate. I can sympathize with that as I often vote for the lesser-of-two-evils, since one candidate is really awful. But if we want to change that and if we want to start voting for instead of against candidates, we have to first establish a presence and that is only done by voting. Once you are in the system, we can primary the lesser-of-twoevils and get real candidates for whom we want to vote. The leaders of SCOPE, as well as other 2A organizations, are more than willing to do the heavy lifting. But they need numbers backing them up to give them credibility and those numbers only come from the voting booth. You start taking back your government and saying “up yours” to the political class by voting. Time is of the essence. If you are not registered to vote, the last day to register is October 12thin order to vote this November. If you are registered then VOTE, YOUR RIGHTS DEPEND ON IT! Jefferson –Lewis SCOPE (Shooters Committee on Political Education) had been actively seeking a site that would hold 300 or more people. The purpose was to invite the public to meet the candidates from either Democrat or Republican Parties. The venue was to be in Watertown which is a central location for Jefferson County. We have been seeking a well-known establishment during a week day for an evening “Meet and Greet” to no avail. Our Chapter is willing to pay the facilities and has insurance that is required to cover events. There would be no charge to the public to come and hear the candidates discuss their agenda, followed by Q & A. We have contacted several facilities multiple times and have received no response. This seems indicative of where we are in society and it confirms my assumptions. We want to be politically correct and allow ourselves to be silenced. Are we afraid of being exposed to demonstrations like those at the Kavanaugh Supreme Court committee hearing? Campaign signs are void of party association and missing red or blue. More and more of us are reluctant to put campaign signs in our yards. We refuse to put campaign stickers on our cars for fear of having broken windows or other damage to our car. The worst embarrassment is, only 30% of us get out and vote. We are blessed in the United States of America with many privileges and we don’t even have to blacken our finger with indelible ink to vote. We can only blame ourselves for letting the process get out of control. We cater to a small minority of those who are disruptive and who fail to contribute meaningful ideas. We tolerate vulgar language by the opposition, rude vocal outbursts, and in many cases violence against us for voicing dissenting viewpoints. Facilities are fearful of controversy and acrimony. We don’t like these facts or the situation but shamefully the tactics of certain political forces are working. They are working because our candidates are reluctant to even attend a town hall meeting. The public will soon withdraw completely from the process. Increasingly worse voter turnout, engagement, and election results will be the proof that the politically correct environment has destroyed public discourse. The easiest way to lose your independence is not to vote. Your vote counts. Don’t let anyone tell you differently. 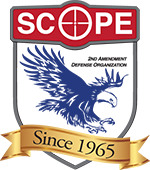 For 16 years, the Yates County SCOPE organization has been active in the mission of SCOPE standing in defense of the 2nd Amendment of the Constitution. Along with this comes the obligation to reach out to the public and educate them on the value of this Keystone Amendment. To accomplish our task, we undertake two separate events that allow SCOPE to headline to the public our goal of education. We work to present the face of New York SCOPE to the community of Yates County. In this endeavor we hold, in August, a Pig Roast for SCOPE that invites in citizens that want to represent us in political office to meet Yates County residents. In October, we hold a Judges night where we have candidates that are running for the Supreme Court of New York, 7th Judicial District to come to Yates County and sell themselves to the voting public. The August Yates County SCOPE Pig Roast is the largest county wide event for political candidates to come face to face with the public. We invite all candidates, all parties, to come mingle, interact and speak to their constituents. On August 25th of this year, we held our 16th Annual Pig Roast. Running in this year’s election we invited the US Senate, US Congressional, NY Gubernatorial, NY Senate and NY Assembly Candidates to our event. Each individual got a chance to speak to the Audience and mingle with the same. Also invited to the event were candidates for the NY State Supreme Court 7th Judicial District. We do not stop with the Federal and State positions that are up for contest. At our event we also carve out time for all County and Town candidates running for office to speak as well. The invitation to speak is made well in advance of our event such that the candidates will have a chance to limit any conflicts in their travel as they move around the state, county etc. On October 4th of this year Yates County SCOPE once again invites the public to attend our Judges Night event held at the Elks Club in Penn Yan, NY. At this event we concentrate on inviting the candidates that will be running for the Supreme Court in the 7th Judicial District. This event has always been well attended and once again, SCOPE opens this event to the public. Education of the electorate is important. The voter must hear all points of view of candidates if they are to become informed. Yates County SCOPE will continue to do our part in bringing all candidates, all parties to the voting public for examination of the issues facing our towns, county, state and country. It’s what we do. “…[T]hey know not what they do” was uttered two thousand years ago and it referred to a political establishment that did not understand the consequences of their actions. Unfortunately, most of America’s political establishment has no idea about the consequences of their current actions. Every four years our President can change and many in the media will hypocritically mention how important – and somewhat rare- it is for a country to have a peaceful transition in leadership. We pride ourselves on following the Constitution and not being a “Banana Republic”. Unfortunately the media seems intent on making us into that “Banana Republic”. Through the two hundred and twenty nine years of our nation’s history, only one serious attempt was made to overthrow the Constitution: it was called the Civil War and 620,000 soldiers and an unknown number of civilians died in it. Now, seven score and thirteen years after the Civil war ended, we face another attempt to overthrow the government. The Washington DC establishment wants to do away with the people’s right to elect our leader, the President of the United States, and they are working tirelessly to bring that about. Most of the political establishment are willing to tear down the Constitution that they swore an oath to uphold in what they believe will be a bloodless coup d'état. They probably anticipate that Americans will sit quietly and go along with it. Our founding fathers warned about a too powerful government and they set up constitutional barriers to prevent that. But those barriers started falling in the twentieth century and government bureaucrats (the Department of Justice and the I.R.S. for example, but not exclusively) now act with impunity to use their bureaucratic powers against American citizens, which now includes using them against the President of the United States. The founding fathers also set up another Constitutional barrier to government overreach; the Second Amendment. What if the political elite succeeded? What if they overthrow the duly elected leader of the country, the person that “We the people” voted into office? What are the unintended consequences of this coup that most – but not all - of the left do not foresee? Without question, that would further empower them to overthrow any future Presidents who the Washington D.C. political establishment doesn’t like. There are an estimated 80 million gun owners with 250 million guns in the United States. What if only ten percent of them are unwilling to go along with the loss of their constitutional right to elect their president? That’s 8 million gun owners with 25 million guns! Most revolutions start with considerably less. Does the political establishment believe the military and police will side with them? If they read history they would know that, during the Civil War, the great generals of the South had been Union officers before the war began. I inferred that most, “…know not what they do” and that most do not understand the unintended consequences of their actions. However, I believe there are some who not only understand the consequences of a coup, the confusion that would follow and the possibility of a second Civil War but they embrace it. Since they want to, “Fundamentally change the United States”, there is nothing like total destruction to bring about fundamental change. I write this not as a threat but as a warning that the primary reason that guns are protected by the Second Amendment is to protect us from tyranny, both foreign and domestic. This would explain why so many in the political establishment would like to see the Second Amendment repealed. We have seen our Constitution and the vision of our founding fathers greatly eroded in the past century. I truly believe most of the far left have never given a thought to the unintended consequences that I highlighted. They are treading on very dangerous grounds. The Constitution and the vision of our founding fathers has been our strength for over two centuries and led our nation to a pinnacle of success unmatched in history. But our position is fragile and our country must regain its constitutional common sense. There was a pre-political correctness saying, “I may disagree with what you say but I will defend to the death your right to say it”. Perhaps the Washington D.C. establishment should take heed that while it may disagree with the President, he was duly elected under the Constitution. Maintain the existing Albany disaster or try Molinaro? There is a real problem in New York. We have a huge scandal that involves Governor Andrew Cuomo and several of his close friends and contributors in what is an overload of corruption. New York has a national reputation for being very high on the list of corrupt governments. The “Three Men in a Room” has long been criticized, but never corrected. Two of the three, Sheldon Silver and Dean Skelos have been convicted, but still are not in prison. Power and money can do marvelous things when abused by talented abusers. However, Andrew Cuomo was the third man in the room and he has not been indicted. There have been calls to have him indicted, but the power and money aspect seem to be working there, too. However, since Cuomo has more than $30 million in his campaign war chest and many huge donations have been connected to lucrative state contracts, it may come to pass that some Attorney General would be interested in having an investigation. Probably would happen if the governor was a Republican. As it stands, in politics perception can have the same effect as facts, and this could influence the election. However, there must be an alternative in the race to make it possible. Fortunately, there is a viable alternative candidate on the Republican and Conservative lines to make the change possible. That candidate is Marc Molinaro who is like a breath of fresh air in a cheese factory. He is a fresh face with fresh ideas that are workable and reasonable. His problem is that, compared to Cuomo, he is underfunded and money is important. As a campaigner, he is outstanding, very likable and has a good program filled with possibilities rather than promises. At a recent campaign stop he spoke of the connections of his opponent to the size of his campaign funds and the timing of the lucrative contracts given to donors. Simple path relating cause to effect! Marc Molinaro speaks to his audience with unusual sincerity for a politician. He does not tell them what he thinks they want to hear. Instead he presents the problems and his intention to solve them. His solutions make sense. Especially in the financial problems of New York! The expected deficit in the Cuomo budget for next year is more than $14 billion. He talks about the tax suckers of state unfunded mandates which is a major problem regarding property taxes. Also, there is much waste and inefficiency in the bureaucracy that can be trimmed. He wants to give the tax breaks to small businesses that are the backbone of the country rather than the large corporations who get huge breaks and incentives. The current scandals involve some big businesses who promised thousands of jobs but haven’t even come close. Calling it “a drop in the bucket’’ would be a huge exaggeration of numbers. The choice should be easy for the voters. As the campaign progresses, there will be the opportunity to make their decision on who will be the next governor. Shall we continue with corrupt and expensive government, or shall we elect someone who will stop the corruption and going deeper in debt? This is a very important decision. Choose wisely, and vote. This will be the last edition of Firing Lines before the November 6th elections. The focus now is the November vote. The next edition of Firing Lines, following the November elections, will focus on the election results and their impact on the 2019 legislative agenda. Our success or failure in the 2019 legislative session will hinge significantly on our success or failure in the November elections. As I’ve mentioned on numerous occasions, it is not overstated to say this is the most important election in generations for New York’s gun owners. In many ways this has been a controversial and sometimes contentious year, especially when it comes to the governor’s race. I won’t waste time and space writing about Cuomo. After eight long years, we all know what we have there and what needs to be done. I’m going to focus on the Republican side and start by telling you about a conversation I recently had with Julie Killian who is the candidate for Lieutenant Governor running with Marc Molinaro. You may remember the controversy surrounding the choice of Ms. Killian for the second spot on the GOP ticket. In a recent campaign for a State Senate seat, she came out and expressed support for the SAFE Act. Obviously, this was an enormous concern for us, and in a phone conversation with Marc Molinaro following the choice of Killian, I expressed our concerns and asked him to reconsider and remove Killian from the ticket. Although Molinaro didn’t say this, most around the state believe this was a state party decision and not Molinaro’s. In any case Killian was kept on the ticket. About my conversation with Killian, I met Ms. Killian at the SCOPE Yates County ‘Meet the Candidates Pig Roast’ in Penn Yan recently. We had a very frank discussion and she was very open about her history as it pertained to firearms and firearms issues. She essentially had little exposure to firearms either growing up or as an adult. She explained she knew little more than what she heard in the liberal media and that was the extent of her exposure. After being chosen to run for Lieutenant Governor she became very aware of the criticisms. Her reaction to the criticism was to study the issue and gain a better understanding of the Second Amendment and particularly Cuomo’s unSAFE Act. During my time with her I went into SCOPE’s position and concerns with the various segments of the Act, and the extremely negative impact on law-abiding gun owners while having no impact on criminals. She was extremely open to the discussion and I certainly came away with the view she has evolved on the issue of guns and the Second Amendment. I specifically asked her if it was fair to say that her position on guns and the unSAFE Act have evolved and her answer was a resounding “yes.” She is absolutely in favor of doing whatever is necessary to repeal the unSAFE Act. Now, I get that we all have a skeptical side to us that questions these ‘death bed’ conversions. I think it’s wise to maintain a bit of skepticism when it comes to whatever any politician tells us. Nonetheless we shouldn’t discount a politician who acknowledges a change of heart. We should applaud that politician for their willingness to approach a subject with an open mind and consider that maybe their position may be misguided or wrong. After all, one of SCOPE’s most important functions is to reach out to politicians and educate and that’s exactly what we’ve done here. This is a SCOPE success story, if the Molinaro/Killian ticket is elected we will have two friends in the executive branch of government in Albany. One comment on Marc Molinaro: It needs to be stated that there is one candidate for governor who has a totally unblemished documented record when it come supporting the gun rights of New Yorkers, and it is Marc Molinaro. It would literally be a tragedy if gun owners do not get out the vote and support Marc this November. It would truly be a lost opportunity, and quite possibly, one we may not recover from for generations. On the legislative side of things, the Assembly as you know is a freedom-loving gun owners’ nightmare. The Democrats hold a two-to-one advantage there and it’s not likely to change. That said, please support those Assembly candidates who do support the Second Amendment as they have a tough job and we do need their voice in the Assembly. On the Senate side there’s been a small group of somewhat moderate Democrats who have helped the Republicans maintain a very tenuous majority. Six of those Democrats lost their primaries and now it’s become more important than ever to elect pro-Second Amendment candidates to the State Senate. During this past legislative year, the New York Senate has been the firewall that has stopped Cuomo’s anti-Second Amendment agenda. We need to keep it that way. This is it. All hands-on deck. This is your chance to let your voice be heard. Cuomo is very vulnerable. He can be defeated. There is a pathway to victory for Marc Molinaro, but it starts with all of us. Let’s make it happen! WE THE PEOPLE have a decision to make in the coming 2 years. Should we re-certify our firearms (pistols) with the NY State Police before January 31, 2018? There will be 3 counties Albany, Schenectady and Fulton doing test runs on the recertification of the Pistol Permit Holders to work out the flaws. They will be sending you an invitation letter asking you to do so immediately. You may be asking yourself what are my options at this point, and is there an advantage to doing this early. We are not asking anyone to disobey any laws, and if you read down below, it gives you the law. Take a minute and look at what they are doing to us law abiding citizens. There is a lawsuit going on, where a retired police officer and a Veteran had problems sleeping and went to the hospital to get checked out. A few days later he gets a phone call that they are coming to seize his firearms because the hospital turned him in. That’s what the so called Safe Act has done. This is only one instance that has taken place in New York State. There are plenty more going on with the HIPPA laws that the state is violating. The state has a data base set up with many New Yorker’s names that are in it, regardless if you own a gun or not. The information they are receiving and forwarding to local authorities is in direct violation of the HIPPA laws. New York City has some of the toughest gun laws in the country, and by the so called Safe Act in 2014, there were 3,930 arrests; 3,173 of these were in New York City alone. These arrests were mainly in the Bronx, Brooklyn and Long Island. Most of these arrests were for violations that already were illegal before SAFE, but were attributed to SAFE. For 32 million tax dollars to implement this, where is the safe part supposed to be? So as I said in the beginning, WE THE PEOPLE have a decision to make…..what will yours be! We need to make this as tough and inconvenient on them as they are making it for us, the law abiding citizen. The information below is what you are required to adhere to. NY PENAL LAW - Article 400.00 / 10. (b): “All licensees shall be re-certified to the division of state police...by the licensee on or before January thirty-first, two thousand eighteen...” [e.g. “re-certify” yourself as NOT being prohibited from owning a handgun]. This requires you [licensee] to re-certify by providing to the NY State Police your name, date of birth, gender, race, residential address, SS#, and firearms possessed together with an affirmation that the licensee is not prohibited from possessing firearms. Note: email address is at the OPTION of the licensee. (c) a rifle having one or more barrels less than sixteen inches in length; etc. [See *”Firearms” Definition Below*] A common shotgun or rifle used by law abiding citizens does not need to be included. Nothing in the statute confers upon the State Police the authority to approve or disapprove re certification. It is only a local licensing officer who has the authority to issue, deny or revoke a pistol license in most jurisdictions. This would be a judge or justice of a court of record in Upstate NY having his office in the county of issuance. You will receive a letter with an ‘invitation’ to re-certify immediately. The ‘invitation’ will be to recertify on-line. This will allow you to provide the state with your personal information in a database format. 1. Go to the state website listed in the letter and print a hard copy of the form. 2. Mail the form via CERTIFIED MAIL thus confirming it was mailed and received. 3. Mail the form on Monday JANUARY 29, 2018 or Tuesday JANUARY 30, 2018. NO re-certifications are LEGALLY required prior to JANUARY 31, 2018. (January 1, 2015) It is mind -boggling that we’re now living in 2015. I like to think I’m not so old, but I also remember when 2001 was a distant date in a science fiction movie. I’m still waiting for the flying car I was promised. But flying cars weren’t the only things we were promised back in the good old days. Looking back at when we were looking forward to these days, I remember predictions about a coming ice age, a unified world government, and the end to crime, hunger, and poverty. There were also lots of predictions about the end of gun ownership. Back when groups like the National Coalition to Ban Handguns and Handgun Control, Inc. were new, they openly proclaimed they were going to completely destroy the “gun culture” by slowly adding one little restriction on top of another over a couple of decades. More than 40 years later, they are sticking to that strategy with new language and new tactics – along with new names for their groups – but the objective remains the same. They’ve made some progress on some fronts, but rights supporters have been working hard too. Our successes have pushed the anti-rights extremists to back completely away from open demands for banning and confiscating guns, and instead calling for thinner and thinner slices off of the Bill of Rights. Instead of calling for national registration of all guns and gun owners, they now call for “universal background checks,” something that sounds completely different, but accomplishes much the same thing. Under their “background check” proposals, government records would be created for every firearms transfer – records that could, with a minor legislative adjustment, be computerized to identify almost every legal gun and gun owner – thereby accomplishing a major step in their goal of universal registration. The anti-rights crowd depends on misleading language, hidden agendas, and a gullible, uninformed public to accomplish their goals because they know they will never win if they openly express their true objectives. They have the financial backing of self-righteous billionaires like Mike Bloomberg, George Soros, and Bill Gates to inundate the uninformed masses with their emotion-laden propaganda, and the full cooperation of the mainstream media to reinforce their misleading message. But anti-rights groups consist of a few paid staff members, a few deep-pockets “angels” who fund their endeavors, and a few supporters who might show up for a rally or write an occasional letter to a politician. The anti-rights support is broad but shallow, with few supporters who actually know much about the issue. Rights groups, on the other hand, range from the NRA with its 5 million-plus members, to local gun and shooting clubs in almost every community. There are state associations and genuine grassroots gun rights groups in every state as well, along with several smaller, national rights organizations like The Firearms Coalition. Beyond these single-issue groups, gun owners also enjoy the support of a variety of broader interest, conservative and libertarian organizations. Gun control groups have demonstrated that they and their media friends can produce polls showing broad popular support for their carefully worded proposals, but rights groups are able to turn out truckloads of mail to politicians, thousands of activists at rallies, and game-changing numbers of voters in elections. In short, the anti-rights “movement” has money and an emotionally appealing, though misleading, message, but few committed supporters. Conversely The rights movement has tens of millions of active supporters, hundreds of small and large organizations, and a message that doesn’t resonate as well with the general public. Simply put, that message is: We, and our guns, are not the problem. Leave us alone and focus energy and resources on actual problems and workable solutions. The one thing gun owners and supporters of liberty can do in 2015 and beyond to protect our rights and prevent the tyranny of an illinformed majority, is to sign up for email alerts from state and federal rights groups, and resolve to make a phone call, send an e-mail, or post a letter every time those groups raise an alarm. That sounds simple, but rarely do more than 10% or so of alert recipients take the few seconds needed to accomplish even that simple task. If you care about protecting the Bill of Rights, be sure you’re tuned in to groups that can keep you informed, and make a resolution to take action every time your local or federal rights groups call for your help. You can find many active, state and local rights groups listed at www.GunVoter.org and you can sign u p f o r o u r a l e r t s a t www.FirearmsCoalition.org. Education, organization, and action are the keys to defeating assaults on our rights. Resolve to make a difference in 2015. Be informed, be involved, take action, and be part of the solution. ©2014 The Firearms Coalition, all rights reserved. Reprinting, posting, and distributing permitted with inclusion of this copyright statement. www.FirearmsCoalition.org. On Friday, February 6, a meeting organized by Yates County SCOPE chapter President John Prendergast was held in the Big Flats Town Hall for leaders of the southern tier SCOPE chapters and our elected officials. The purpose of the meeting was a frank interchange of comments regarding our efforts in Albany to repeal Gov. Cuomo's so-called SAFE Act and future directions in resolving this issue. Officials present were Assemblymen Phil Palmesano (132nd district- Chemung, Seneca, Schuyler, Steuben), Assemblyman Chris Friend (124th district- Broome, Chemung, Tioga), State Senator Tom O'Mara (58th district- Chemung, Schuyler, Steuben, Tompkins, Yates), and Joe Sempolinski from Congressman Tom Reed's 23rd congressional district office. With the exception of Broome County, Congressman Reed represents these counties as well as Allegany, Cattaraugus, Chautauqua and Ontario. The meeting room was pretty much filled and while no attendance list was taken, nearly all, if not all, of the eight Southern tier SCOPE chapter counties were represented. The meeting kicked off shortly after 2:30 pm with opening comments from Yates County SCOPE president John Prendergast. John thanked everyone for coming and explained the reason why the meeting was set up and that if others had issues they wanted to bring forward, an opportunity for them would be made available at the conclusion of the program. John pointed out that SCOPE is working hard organizing new SCOPE chapters, and registered voters- regardless of political affiliation - to support those political candidates that recognize our Second Amendment Rights and to continue to keep control of the NYS Senate. SCOPE stated position is full repeal of the SAFE Act. SCOPE is stronger now and is a recognized voice in the political arena and is being heard. Phil Palmesano has always been a strong Second Amendment supporter and a strong SCOPE supporter as well and his opening comments were pretty much in that light. Assemblyman Chris Friend, in his opening remarks, pointed out that while a couple of years ago there were only 14 counties that had active SCOPE Chapters, there are now, as a direct result of passage of the SAFE Act, 43 upstate NY counties with SCOPE Chapters and three more counties with organizing committees (Chris had done his home work well before the meeting). SCOPE is making a better connection in getting people registered to vote and getting them to the polls. Chris went on to mention that several races are decided by just a handful of vote differences and that absentee ballots are important and we need to work to get more people to send them in if they are away during actual voting periods. Joe Sempolinski said that if Tom Reed had been a member of the state legislature, he would have voted against the Safe Act. Tom Reed is in favor of the reciprocity bill and, according to Joe, has an excellent voting record where the Second Amendment was the issue. As for the .223 green ammo situation, congress is working on the funding for the DHS; but the president is using executive orders to get around congress. Senator Tom O'Mara took over from here and gave us a lot of insight as to the workings of the legislature. Getting full repeal of the SAFE Act is nil as the downstate dems control the assembly and they are not going to vote for repeal and the governor will never sign a bill doing it. State Senate Chair Dene Skelos told a group of senators that passage of the SAFE Act was a mistake. John Predergast pointed out that while Skelos might say that now, in the past he was anti-gun. Senator O'Mara pointed out that the budget for NY is not a line item budget where specific items can be crossed out. Various agencies put in the budget the things they want the money for and they get a pool of funding as a result. From this money, they can move things around pretty much as they see fit. For example, while the ammo purchase background check software technology required in the SAFE Act is not currently available, there is no way to prevent funding for it in the budget process. Another SAFE Act issue regarding the State Police controlling the 5 year renewal of concealed carry permits, getting it put back into the hands of county clerks where it is now would become another unfunded mandate from the state. There might be some light at the end of the tunnel regarding definition of the assault rifle definitions. Pistol grips will probably remain, but the thumb hole in the stock might be eliminated (I took a rifle apart and brought a thumb hole stock to the meeting for the legislators to see just in case they were not up to speed on just what it was. My question to all of them was just how does this make any rifle more of an assault rifle?). Comments from here went onto some other Albany issues. Cuomo sees teachers, in effect, corrupt as well as his own legislature. He actually believes it, which brought a bit of laughter from the audience. Just about every group that has to deal with the governor's office sees him as a bully- his way or the highway. Both sides of the aisle see it the same way and feel the pressure from it. As for using the NYC rent subsidy issue as a bargaining chip to get some SAFE Act changes, Senator O'Mara pointed out that true, this was a big issue for NYC; but at the same time, upstate people look for property tax rate caps and they are not a NYC issue. So there goes the standoff. It was pointed out from the audience that the state constitution does not have Second Amendment provision. Getting one as an amendment is not going to happen. However, the proposed state constitution convention in 2017 would be the place to handle it. Senator O'Mara would like to see this and may promote it. Senator O'Mara is also in favor of mandate relief. Additionally the state rules concerning the Passage due to Need of Necessity (which Cuomo used to push the SAFE Act to a vote) needs to be revised. But getting 60 down state assemblymen to vote SAFE Act repeal is not going to happen. From the audience - There are some who would like to see a senate and assembly vote on the repeal of the SAFE Act so we could get feel of who those legislators that vote against it. While this was not brought out at the meeting, upstate senators and assemblymen are listening harder to SCOPE and other Second Amendment groups like it. The reasoning is not hard to find. In November 2014, 28 NY legislators were not reelected. Some chose not to run for reelection. But 21 of those who voted for the SAFE Act were voted out of office! Fifty two county legislatures passed anti-Safe Act resolutions. Two hundred red sixty five Town Governments did likewise. SCOPE plans to continue to organize new chapters and recruit new members in significant numbers and its Albany voice will continue to grow. Governor Cuomo has awakened a sleeping giant and he knows he shot himself in the foot with the passage of the SAFE Act. He badly misread his constituency, thinking he would ride into Washington on the SAFE Act's coat tails, but he torpedoed his own ship for all time. He might be governor of NY for another 4 years, but his political career is over.